Murder, Revenge, and Real Estate. It all happens in the city of Fort Atkinson. 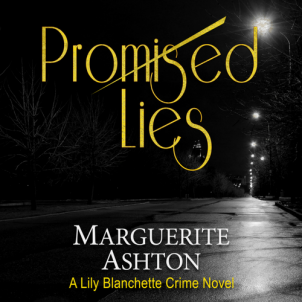 The first book in the Detective Lily Blanchette series is now available on Audible, iTunes, and Amazon. MILWAUKEE - Aug. 7, 2018 - PRLog -- Promised Lies, produced and read by Renee Dodd will be followed by Her Final Watch, The Parolee and Ten to Midnight. Marguerite said, "I've enjoyed working with Renee. She's professional and goes the extra mile to make sure everything works for the audiobook. I'm excited that Renee has signed on to lend her voice for the second book in the series, Her Final Watch. It will be released later this month. "What has been even more powerful for me as a writer is hearing from the readers cheering for Lily - a female homicide detective of mixed race who prides herself on balancing work and family. She's human. She's a mother. A person who cares for her victims. And at the end of the shift, she has to find a way to balance all of the above. Her sister, Celine, has recently been murdered, and her parents are on the brink of divorce. Now she's lead on a multiple murder investigation. Six months after Lily's sister's death, the bodies of two young women are discovered. One look at the way the bodies have been posed and Lily knows her sister's killer is back. And she's determined to get him. When Lily visits the family of victim Tanya O'Neal, she learns the woman had arranged to meet a man going by the handle CtryGeek23 on the social networking site Scatter. When Renee Dodd had to endure a two-hour commute to her job, it was lattes and audiobooks that helped make the drive more comfortable. But as she continued to enjoy listening to mysteries, she realized she wanted to become an audiobook narrator. Later, after finding herself at a career crossroads, Renee decided to make that dream a reality. She began studying with experts in many areas of voice performance. Now, she's doing what she enjoys. Renee Dodd is a native Oregonian with two tortoise-shell cats, one crazy dog, and a delightful son. You can learn more about Renee's work on her website at reneedoddreads.co.